I haven't blogged much this week and in a way, it's been kind of nice. I've been spending less time on the computer and more time on other hobbies. Plus, I just haven't felt all that great this past week and I've been napping a lot. I started a new cross-stitch. It's a large one, so it likely will not be finished for another year, but it's always kind of fun to embark on a new cross-stitch. I've been reading new issues of Bon Appetit, Food & Wine, and National Geographic. I have a pile of 4-5 library books I'm slowly making my way through. The one I am currently reading is by Brad Thor, who writes thrillers. The books are usually about secret agents and international intrigue, etc. The Athena Project is about an all female Delta team trying to stop a terrorist attack. SP & I got hooked on Big Bang Theory this past TV season so almost every evening we've been watching episodes from seasons 1-3 on DVD. We've finished season 1 & 2 and are 4 episodes into season 3. I'm surprised I am enjoying the 'geek humor' as much as I am! We haven't done anything too exciting in the kitchen. There hasn't been much time for cooking. Sunday morning we roasted a chicken and we've been eating that with CSA veggies and some leftover pita for dinner every night this week. We stuffed the chicken with rosemary, sage, and thyme from our herbs on the deck. We also used up some CSA potatoes, roasting them with our fresh chives & rosemary. 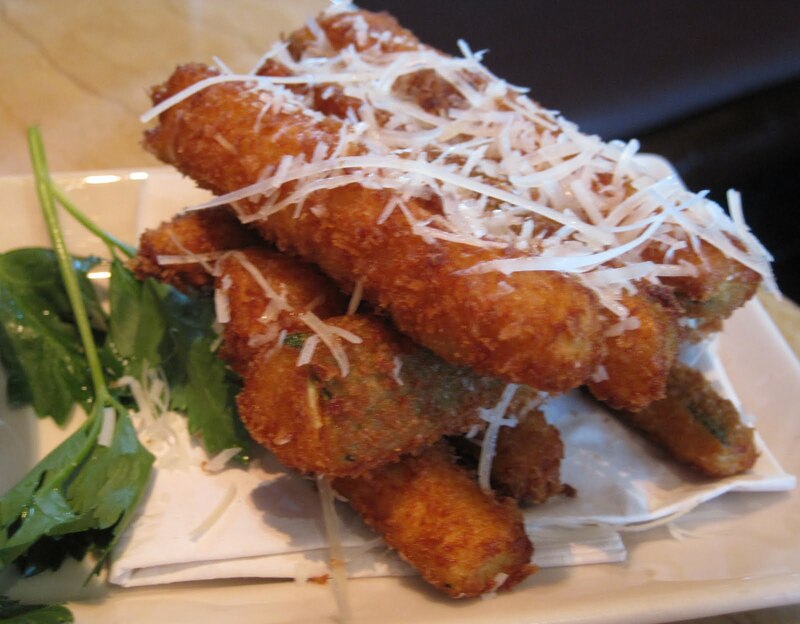 Last weekend we decided to use a gift card for Cheesecake Factory. We tried the fried zucchini: I really enjoyed the fried zucchini. I liked the chunky strips instead of the usual skinny planks. 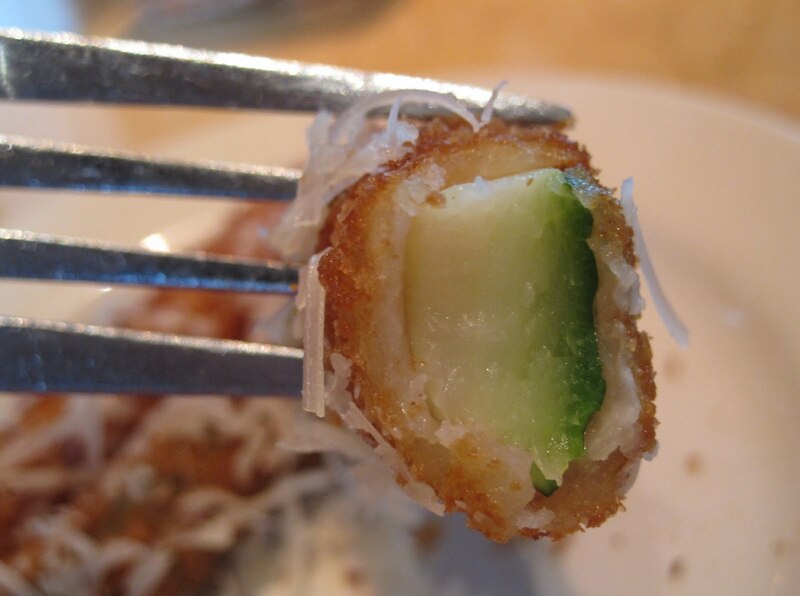 There was definitely zucchini taste, it wasn't overshadowed by breading. 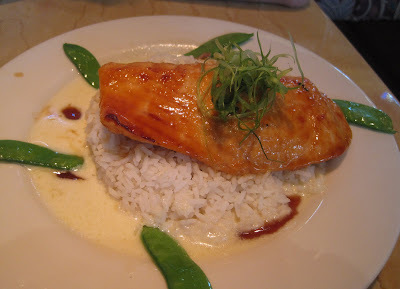 SP ordered miso glazed salmon. I was surprised he ordered this because it came with white rice and usually he doesn't like white rice. Plus, there wasn't much veggie in the dish and it looked like a cream sauce and usually he doesn't order creamy dishes. He said the fish was good and the rest just OK. I ordered my usual shrimp, bacon, tomato, lettuce sandwich with salad. The salad was very tasty and I shared with SP so that he could have more veggie. My sandwich was a little disappointing. It just didn't taste as yummy as usual. We got 2 pieces of cheesecake to go: tiramisu and lemon raspberry. Both seemed different though we couldn't really pinpoint why and they were just OK.
Last weekend we also went to Z's birthday dinner at Mitchell's Fish Market at the Waterfront. It's not really a place I enjoy since I don't really like fish and the seafood I do like (shrimp, crab) is either fried, too expensive for what you get, or not really that tasty (I've tried all the shrimp/crab dishes there). 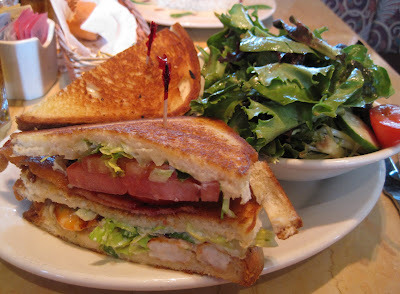 I also wasn't all that hungry because the family met at 4:30pm, and while we weren't actually served any food (bread/appetizers) until 5:15~5:30pm, even that is still 2 hours earlier than we usually eat, plus my Cheesecake Factory Shrimp BLT had upset my stomach a bit (I ate half for dinner on Saturday then half for lunch on Sunday). I felt pretty queasy and attacked the bread basket quickly, hoping the plain bread would settle my stomach. I ended up ordering a cup of Lobster Bisque, which was disappointing (not very lobster-y and not very bisque-y, more tomato-y) and a Spinach Salad with bacon, goat cheese, and pecans, which was pretty tasty. SP ordered a blackened trout, which he said was just OK.
Tonight is chicken. Again. For the 5th day in a row. I don't know if we've been eating less or if this a huge chicken, but it sure is lasting a long time! We still haven't decided what we're going to cook for next week, but we do have a HUGE head of lettuce from the CSA, so I'm pretty sure we'll be eating salad for 5 days in a row next week! The Big Bang Theory had the same effect on me - I wasn't expecting to love it so much! Re: chicken + salad - perhaps make chicken salads?